Estetica Dental is made up by a team of oral health and care profesionals working in Palma de Majorca with the goal of promoting the dental health and aesthetics of our patients. Our practice has the latest technology in order to perform the most demanding treatments, with state of the art equipement that guarantees perfect sterilisation with autoclaves and individualised material for each patient. Besides our practice has comfortable waiting rooms where those acompanying you can wait whilst reading or listening to music. Dental prostheses allow many patients to recover the aesthetics of their mouth. See our solutions in real cases of our patients. We have the best tool for surgical implant cases. We are your dental clinic in Palma de Mallorca. We are specialists in clear orthodontics system Invisalign® in Palma de Mallorca. We are specialists in Digital Smile Design. Contact us and we will inform you of the progress you have at your disposal. The guided surgery together with the latest techniques in bone regeneration, allows us to offer our patients an improvement in their quality of life. 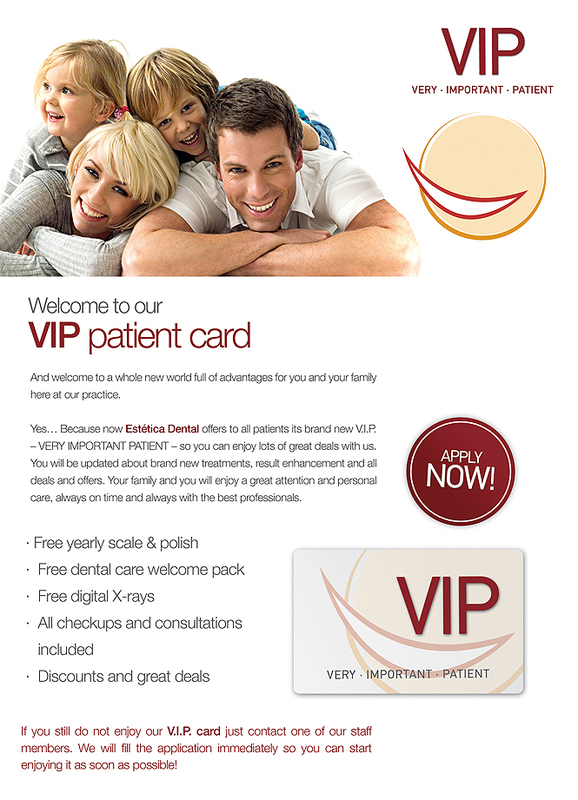 Now Estética Dental offers patients their new VIP card – VERY IMPORTANT PATIENT. Here at Estética Dental we have been over 30 years taking care of our patients, our motivation during this whole time. Our team has the finest professionals, specialists with huge formation both national and international. Our state-of-the-art-treatments based in the latest materials and techniques guarantee excellent and reliable results. Our patient´s care i sour priority to us. You are the most important person. We are always on time, because your time does matter! Also, with our latest technology, our treatment times can be shortened up to a half. Our 30-year-experience is our best reference. Hence, all our prosthetic work and implants have a 5 year guarantee. We will fit your needs, with many great deals and financial help.